As a person Rajesh Deoria is quiet and somber, and so are his sculptures. While his sculptures bear all the traits of contemporariness, they are devoid of noise and are also least verbose. Rajesh generally works with scrap metal to vent out his emotions to his viewers and for that he assimilates lot of meaningless waste metal pieces together to shape his meaningful sculptures. This is a strange process of synthesis, which represents not just the skill of a sculptor, nor the quality of the material he uses but essentially speaks about his insight. And on this account Rajesh shows his courage to confronts with a lot of ‘reputed’ sculptors of his time who believe that arduous wordy narratives (seemingly philosophical !) , the quality of materials , the use for their sculptures and the sheer size provide a natural ground for their claims as creative entities in present day society . In recent time we have seen a spate of the use of high value materials ranging from expensive alloys, high grade stainless steel and sometimes even pure gold! Through the shocking use of strange objects their attempts to prove themselves as brave artists involved in giving new dimensions to the meaning of art has actually resulted into a sharp and unfortunate dichotomy among the art lovers. This fact also exposes an unholy concept of taste to be class based and thus wiping off a larger class of pure and erudite art lovers from the present day art scene. 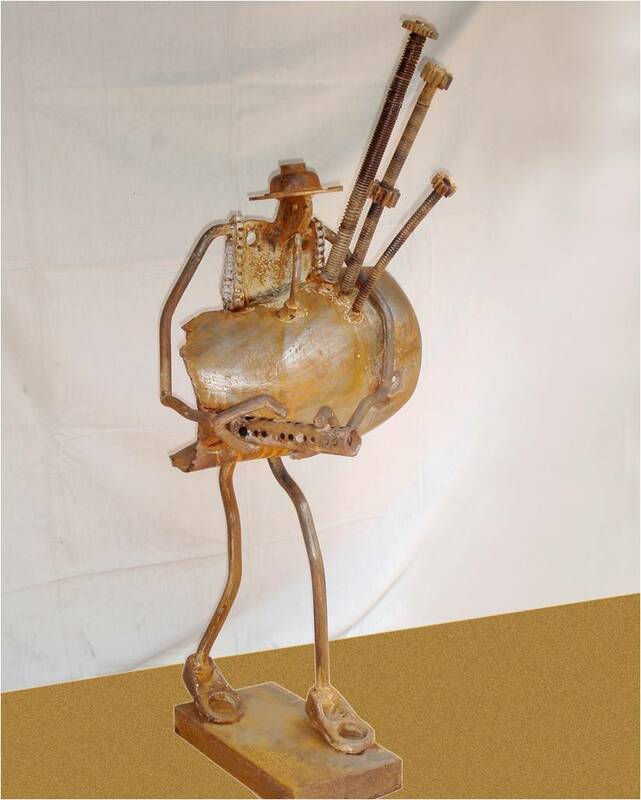 Against such a backdrop, the scrap metal sculptures of Rajesh Deoria offer a whiff of freshness , almost like a poem that touches the heart without an attempt to be cerebral or over didactical. His technique involves a tedious process of identifying the apt components for an intended assemblage, that is to see the sculpture with all its details much before it comes into being. Rajesh believes in uncomplicated forms where the postures and movements are pronounced carefully. In his sculptures one can find the dead and thrown away familiar objects coming alive as component of an altogether new form. Rajesh actually takes the viewers on an exciting journey to unfold the intriguing relationship in between components and the sculptured form. He makes the viewer an active partner of his immensely creative maneuverings and there lies the success of those artists who believe that to be modern is to be with the masses!